became too small (less than the size of a pinhead!) and my toes got too cold. 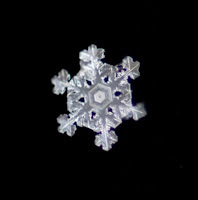 The detail in the center of the bottom snowflake is incredible! Click on the photo to enlarge it. After a very late breakfast Kenny and I drove down to Spring City to go hiking a t Piney Falls. I was thrilled to see 4 large sandstone boulders blocking trails that had been cut through the woods by the local people wanting to go 4-wheeling on the road. The last time we went hiking there we were appalled at the damage that had been done to the road by uncaring people. I sent photos to the department that is in charge of the State Natural Areas to show the damage. We drove down to the area because we wanted to see the waterfall frozen. We'd seen it during every season and in all kinds of weather conditions, but never fr ozen. We enjoyed seeing the large icicles along the trail to the bottom of the falls. I'd hate to be around when those things fall as the temperatures begin to warm next week! We were amazed when we saw the waterfall! It had a huge mound of ice that looked like a volcano below the falling stream of water. The cliffsides had beautiful, long icicles hanging from them. What a spectacular sight that was. This can happen only when the temperatures have been well below freezing for an extended amount of time. It has been extremely cold for over a week here now. I also enjoyed seeing the interesting pattern made by the water as it flowed down the trail and froze. It was interesting until I tried to walk on it an d I slipped and fell. I have a nice bruise on my gluteus maximus now! This week has been colder than a well-digger's posterior in East Tennessee! To not get above freezing here for over a week is newsworthy. The dusting of snow that we received yesterday hung around and the roads were pretty bad today. So, Kenny and I stayed home (he was off anyway) and I had my camera hanging around my neck much of the day. I kept hoping to have some snow flurries, but the clouds didn't deliver much. 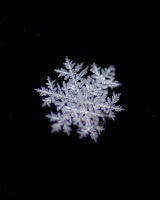 The snowflakes I did catch were the size of a pinhead, not much to work with! 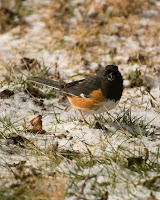 I was constantly changing between my macro lens to try to photograph snowflakes and my telephoto lens to take pictures of the birds. I enjoy watching the birds on the tree outside the living room window. They were busy visiting the feeder and gobbling up any scraps that the smaller birds scattered on the ground below. 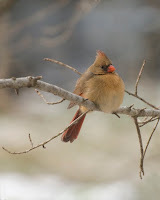 Many of the resting birds were very fluffed up in an attempt to stay warm. This female Cardinal (left) and Blue Jay have puffed up their feathers to help trap warm air. 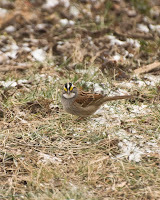 I was amazed at the number and variety of birds on the ground. The cardinals are too big to grasp the sm all perches on my new "squirrel-proof" feeder, so they have to be content to scavenge what they can find below. 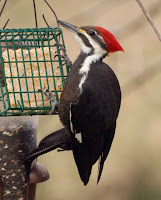 Many of the smaller birds throw out what they don't want from the feeder, so it doesn't go to waste. 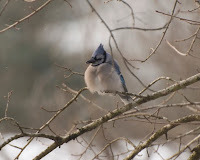 Along with the cardinals, I saw Towhees, Blue Jays, White-throated Sparrows, and Carolina Wrens. him hop up and down the tree following behind the fleeing smaller competitors. Well, we finally got some snow, but it has been a bit of a disappointment. I was really looking forward to the 1" - 3" that had been predicted, but all we have so far is just a piddly dusting and the local radar shows the snow band moving out very soon. :( It started around 1:00 PM while I was having lunch with a friend. When she and I left the restaurant the snow was coming down in little needles. 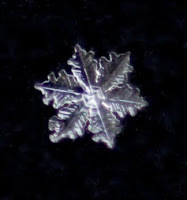 This means the cloud temperatures were between 21 - 25 degrees F. Some of the snow was in little icy clumps called graupel. Around 3:00 PM I went out again and saw that the snow had changed into ve ry grainy flakes, kind of like "sugar-frosted snowflakes". 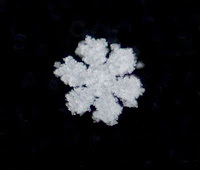 They had the general shape of the dendrite flakes, but they had tiny pieces of ice all over them. 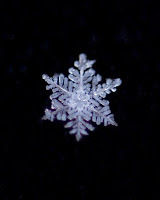 So, this shows that not all snowflakes are created equally! Yesterday my friend and co-worker, Renee, told me about some "ice flowers" that were in a powerline cut across the road from her house. I drove ov er to see them and ended up parking in her neighbor's driveway by mistake. She came out to see who I was and what I was doing; I have to talk my way out of a lot of odd situations! 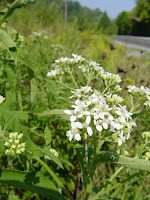 Ice flowers are actually frozen sap from the roots of White Crownbeard, a very common fall wildflower. When the temperatures stay consistently cold, the sap oozes from the roots and freezes into some interesting shapes. These were the biggest I'd ever seen. They were very fragile, I had to be careful if I tried to move any dead plants or stems out of the way. I still ended up breaking a few. So, if you see something white that looks like a lot of trash that has been dropped on the side of the road, look more closely, it may be a lot of ice flowers! 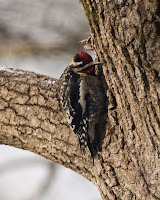 Just as I was about to leave to meet Theresa at the restaurant, I looked out the back win dow and saw not one, but two Pileated Woodpeckers on the tree! 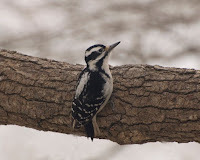 The female was eating suet and the male was hopping around on the tree. Unfortunately, in my e xcitement, I forgot to chance the settings on the camera from taking snowflake photos and it was stopped down -2.7, so the photos I took of him came out really dark! 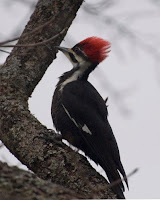 He had a red streak on his face, which helped differentiate him from his mate. 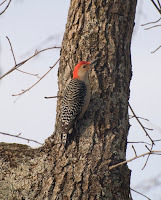 These woodpeckers were the model for the Woody Woodpecker cartoon series that I watched as a kid. I'm glad the real ones aren't as mean and conniving as he was! 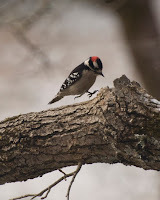 :) I got a kick out of seeing "Woodette" when she finished eating and hopped up the tree, she raised her crest and looked like she had a mohawk! I hope we will have some more chances for snow in the next couple of months. It seems like it always hits all around us, but we get little or nothing. We are due a good one this winter! I want to get some nice snow photos. When I got up this morning I glanced out the window and saw a few snow flurries. I quickly threw some warm clothes over my PJs and went outside with my black velvet, camera and 105mm macro lens with a 36mm extender ring. 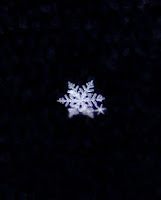 Fortunately, it was not windy so it made capturing the snowflakes and photographing them a lot easier. Actually, it is not easy to do because I have to kneel on the concrete patio to be able to get close enough to focus on the snowflakes caught on the black velvet. That is really tough on the old knees! :( But, I was quite pleased with a few of my photos! The more I practice, the better they should be. I'm learning new tricks every time I try this technique. 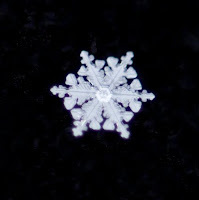 These are called dendrite snowflakes, they form when the temperatures in the clouds are 3 - 10 degrees F. It was 16 degrees on the ground while I was photographing them! Brrr! 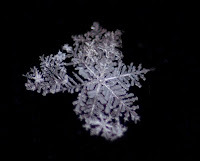 Often the snowflakes fall as clusters, like these on the right.